Unfortunately there is no information about Beaujolais AOC available. The French winegrowing area counts to wine law Burgundy and lies in the extreme south of this winegrowing region. Historically it never belonged to it. The northern part of Beaujolais belongs to the Département Sâone-et-Loire and thus administratively to Burgundy. The majority, however, with the capital Villefranche -sur- Saône belongs administratively to the Département Rhône and thus belongs to the region Rhône-Alpes. The southernmost part of Beaujolais is its own appellation Coteaux du Lyonnais, It is an ancient winegrowing area, because among other things at Mont Broully (one of the cru communities) remnants of Roman vineyards were discovered. In the 7th century were from Benedictine monks created more vineyards. The name derives from the Burgundian aristocracy of the Beaujeu, who ruled here in the period 950-1400. At the foot of its castle fortress was built in the 10th century the town called Beaujeu. The independence of Burgundy came from the Edict of the Duke of Burgundy Philip II the Bold (1342-1404), with the cultivation of the Gamay vine was banned in the actual Burgundy. Until the mid-17th century, however, viticulture played only a minor role here. This was also due to the poor transport of the wine to the large acceptance places, the wine was therefore consumed mainly in the area itself. Only through the construction of the Briare Canal, which from the year 1642, the two rivers Loire and Seine joined, then finally the market also opened up for Paris. The area stretches over 50 kilometers in length and 30 kilometers in width. To the east lies the river valley of the Sâone, to the north is the Burgundian area Mâconnais with which Beaujolais overlaps to a small extent. There are two different geological areas. Granite prevails in the north with the best quality wines, but limestone in the south. The ideal for viticulture, temperate climate has continental, Atlantic and Mediterranean influences. The vineyards occupy about 22,000 hectares of vineyards at an altitude between 200 and 450 meters in 96 communities. The market is big Winzergenossenschaften controlled. Around 2,500 winegrowers own only small vineyards with a few hectares. The red Beaujolais is mostly unmixed from the classic Beaujolaistraube Gamay whose special feature is the white pulp (the full name is Gamay Noir à Jus Blanc). Nowhere else does this strain have meaning. Their share of the vineyards is 99%. This extreme monoculture arose after the Phylloxera disaster, To prove the tiny remainder Aligoté. Chardonnay. Pinot Gris and Melon de Bourgogne for the white wine, but also up to a maximum of 15% for red wine and Rose allowed are. The Pinot Noir was allowed to be mixed by 2015 to 15% of the red wine. Beaujolais Blanc and Rosé are almost unknown outside the area and do not matter. The red Beaujolais must be dry and are usually soft or little tannin, fresh and aromatic. For the Beaujolais Nouveau for export or especially on the French market as Beaujolais Primeur designated wine, the intact, whole grapes with the method Macération carbonique fermented, during which a lot carbonic acid forms. The fermentation lasts one to two weeks. This fully unfolds the aromatic potential of the Gamay grape. The bright ruby ​​red to bluish wine has relatively high acidity and a fruity aroma. It may be marketed from the third Thursday in November and is young to drink within a year. With a big party in Beaujeu on Wednesday before the third Thursday in November, the new vintage will be released. There is a torchlight procession, a banquet and dancing. At the "Mise en Perce" at midnight the tapping takes place. Every year, 60 million bottles are produced from the world's popular wine, of which 50% are exported to 200 countries. This quickly produced wine has its lovers, otherwise it would not be so successful. But his critics even deny the drink, also known as "Lollipop wine", the right to call itself "wine". Come through the averted by many winemakers special form of fermentation boiled sweets Aromas of bananas, sweets, chewing gum and, in the worst case, nail polish ( Solution midrange ). The British wine writer and Master of Wine Anthony Hanson mentions in the book "Burgundy" a well-known winemaker from the Beaujolais, who denigrates this fermentation technique derogatory as "carbonic masturbation". So even in Burgundy, despite the undisputed sales success, one dislikes this type of wine. The more durable and tannic wines are with the classic maceration vinified. These are usually filled only after one year. Every year on the second Sunday of December there is one auction (Auction) of wines with a charitable purpose. This "Hospices de Beaujeu" was first performed in 1797. That was 62 years before the much more famous one Hospices de Beaune, The price of a bottle item must be outbid until the flame of a candle is extinguished. The association owns 65 vineyards. A special feature of Beaujolais is the traditional serving bottle Pot Lyonnais with an extremely thick glass bottom, which keeps the previously cooled wine on the table cool for longer. Beaujolais : The simple appellation is in principle open to all winemakers, but is mainly used in the southern half of about 10,000 hectares of vineyards. In this dominates clayey limestone with sandstone. The wines pressed here are significantly lighter than in the north and can not match their quality. At least 10% vol alcohol content is required. The main producers are large cooperatives such as Cave Beaujolaise du Bois d'Oingt, Cave Cooperative Beaujolaise de St-Verand and Les Vignerons de la Cave Bully. The appellation Beaujolais Supérieur applies to wines with 10.5% vol alcohol content (hardly used). 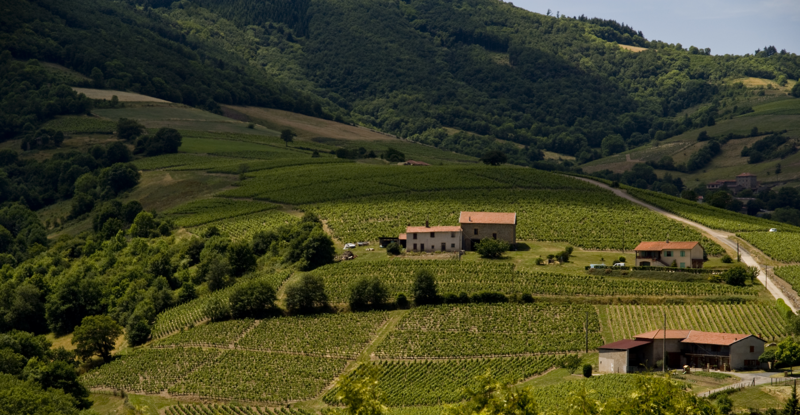 Beaujolais Villages : The appellation covers about 5,000 hectares of vineyards in the north. The fictitious dividing line to the south is the municipality of Villefranche-sur-Saône. The floors are made of granite, porphyry and slate with sand and clay (without lime). The weathering of the granite rock in the form of quartz sand forms at certain points a layer of ten centimeters to several meters thick. This is the ground on which the Gamay Vine yields the best results. A total of 38 municipalities have the right to name Beaujolais am t, of which have the ten Cru status listed below. If it is a mixture of two or more municipalities, "Beaujolais Villages" must be used. Eight municipalities have the right to use the wines as Mâcon-Villages and four of them as well Saint-Véran market. Beaujolais Crus : Ten communities in the northern area have cru status, which, unlike the other appellations, applies exclusively to red wines. Their vineyards cover around 7,000 hectares. Especially these wines have made the name Beaujolais famous. At first glance, many are not recognizable as Beaujolais, because often only the community appears on the label. Also Flurnamen and layers can be added. The communities are Brouilly. Chénas. Chiroubles. Côte-de-Brouilly. Fleurie. Juliénas. Morgon. Moulin-à-Vent. Régnié and Saint-Amour, The wines of Crus Chénas, Morgon and Moulin-à-Vent are considered the best. Nine Crus (except Régnié) may be Gamay wines as well Bourgogne market. Everywhere else in Beaujolais this is denied only to the (little) produced wines from Chardonnay or Pinot Noir. Well-known producers of Beaujolais are Château du Bluizard, Domaine Jean-Marc Burgaud, Domaine F & J. Calot, Château de La Chaize, Domaine Champagnon, Domaine Emile Cheysson, Michel Chignard, Louis-Claude Desvignes, Domaine Desperrier, Duboeuf, Jean Foillard, Domaine de la Fully, Domaine Gay-Coperet, Château des Jacques, Paul Janin, Bernard Jomain, Domaine Benoit Trichard, Hubert Lapierre, Jean Lathuilière, Domaine des Marrans, Domaine Laurent Martray, Alain Michaud, Domaine Gilbert Picolet, Domaine Dominique Piron, Jean-Charles Pivot, Michel Tête, Château Thivin, Dom. of Terres Dorée, Dom. Benoit Trichard and Domaine du Vissoux.